For the first time a long-neck sander is available that can stretch to ‘hard to reach’ places without the need for a ladder or scaffolding. 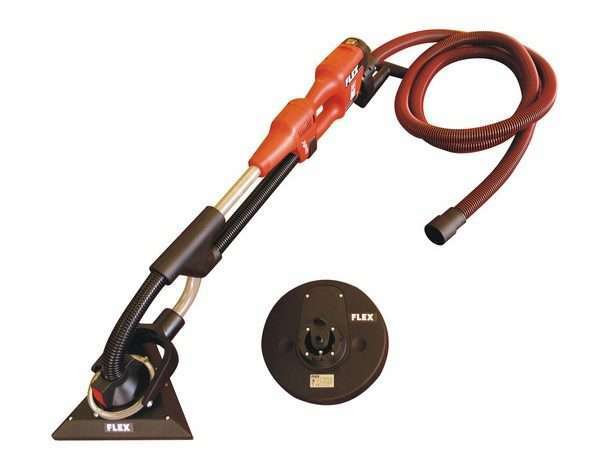 The sander comes equipped with a unique quick interchangeable head system, a 4m vacuum hose for dustless sanding and can telescopically increase its size to reach 1.7m up the wall / to the ceiling. The innovative triangular sanding head makes it possible to seamlessly sand right to edge of walls or ceilings and the round head allows for quick effective sanding of large surface areas. This incredibly light weight 4.8kg unit features 1000 – 1500 rpm (no load speed), 2x Interchanable sanding pads, a plastic moulded carry case and stretches from 1330mm – 1730mm. The FLEX Dustless Giraffe sander is a necessity for wall and ceiling sanding situations.